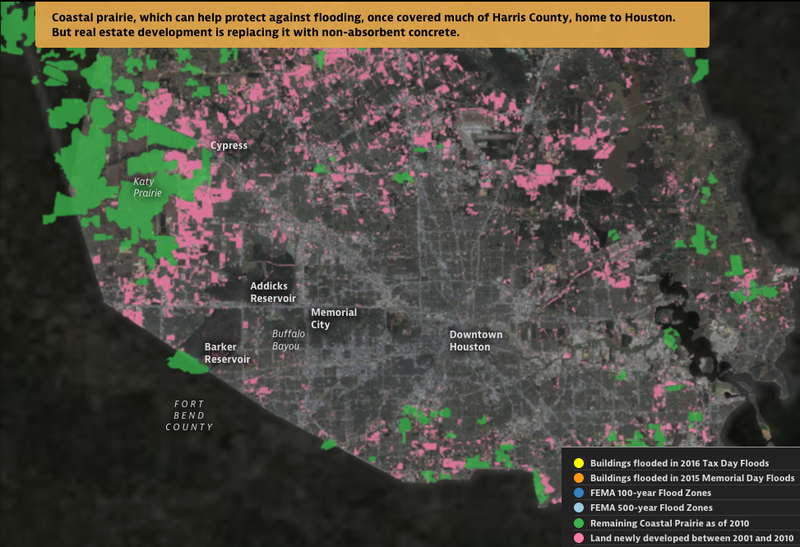 Excellent reporting from the Texas Tribune and PropPublica on the battle over what causes flooding in the Houston area and what to do about it. The Houston Press has also published an informative follow-up interview with the current director of the Flood Control District, Russ Poppe, after the recent retirement of Talbott. Scientists say the fundamental problem is that Houstonians have assumed they can simply engineer their way out of flooding. They can’t. And widening and deepening our bayous and streams is the wrong answer. We need to understand and work with nature. It’s cheaper, more effective, and better for us. Storm water needs to be absorbed, slowed down, and spread out before it reaches our streams. As wetlands have been lost, the amount of impervious surface in Harris County increased by 25 percent from 1996 to 2011, [Sam] Brody [of Texas A&M Galveston] said. And there’s no way that engineering projects or flood control regulations have made up for that change, he said. Between 2001 and 2005, his research found, the loss of flood-absorbing land along the Gulf of Mexico increased property damage from floods by about $6 million — much of that outside floodplains. “There’s no doubt that the development … that we’re putting in these flood-prone areas is exacerbating flooding over time,” Brody said. “There’s a huge body of research out there beyond Houston, across the world” supporting that argument. But Talbott and his successor, Russ Poppe, don’t buy the research. Read this informative report by Neena Satija for The Texas Tribune and Reveal, Kiah Collier for The Texas Tribune; and Al Shaw for ProPublica. And then read the follow-up interview with Poppe, the current director of Flood Control, in The Houston Press. Image courtesy of The Texas Tribune.